Not In My Write Mind features trials and tales from my quest to go from a mediocre writer to a published mediocre writer. Please feel free to share in my struggle and laugh at my pain. Author Caren Widner Hanten (who writes under the name C.W. LaSart) runs a great group on Facebook featuring open calls for horror markets. One thing that makes her group unique is that she only allows paying markets to be posted (with ones for charity being the only exception). For those of us who feel it's important to be paid something for our words (even if it's just a token amount), this is extremely helpful. I understand that many small/start up publishers can't afford to pay their writers, but there are others that have somehow worked their way up to 'elite publisher' status without ever offering any compensation. Plenty of great small presses are out there and willing pay something (even if it's a very small amount) to show their appreciation for your work. It's not going to make you rich...and it might not even be able to buy you dinner...but your writing should always be valued in some way besides "exposure" if possible. 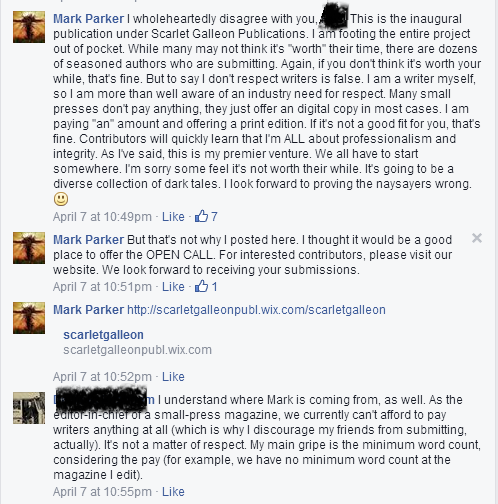 That brings us to Mark Parker and his new publishing venture, Scarlet Galleon Publications. 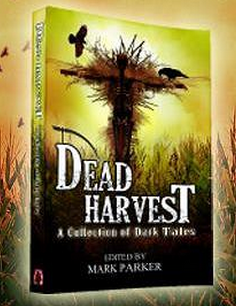 Mark recently posted a very cool looking open call for a Fall themed anthology entitled DEAD HARVEST. The guidelines ask for a Fall-themed horror story that is a minimum of 4,000 words. 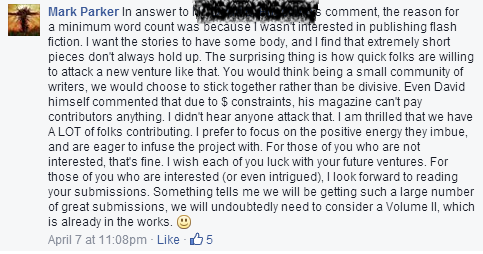 Compensation for accepted stories will be $25 plus a contributor copy. It wasn't long before us writer folks unleashed our deadly math skills and figured out that the payment came to less than $0.01 a word. At this point, Mark found himself on the receiving end of some angrily flung feces. To Mark's credit, he kept his cool and calmly explained why his first time, self funded publishing endeavor was offering what it did...and why he's not a terrible person. Mark even explained his reasoning behind the minimum word count (while still valiantly defending his honor). Eventually, Caren and Selene MacLeod, another queen of awesome open call pages, rose to Mark's defense. Others soon joined in, and before you knew it, we had a full blown popcorn fest. 1. An actual, physical, real life copy of a really great looking book...something you can hold up to your friends, family, and enemies while proclaiming "LOOK WHAT I'M IN" without anyone assuming you've gotten yourself stuck in the toilet again. From a pride stand point, that's a whole lot cooler than holding up your cracked iPad and asking people look at something resembling a late 1990's pdf file. Getting a physical copy of a book you're in that can go up on your shelf is very cool, very rewarding, and very not free. 2. Many writers use The Submission Grinder (free) and Duotrope (not free) to track their submissions. This gives us a database of average acceptance rates, rejection types, and wait times. If you're familiar with either of these databases, then you might have noticed something strange: Occasionally, elite markets will accept someone's work in 1-5 days, while the rest of us wait 1-2 months for a form rejection letter (please ignore my bitterness). How did those people get their work read so fast? Shouldn't editors and slush readers just be looking for the best stories no matter who sent them in? The truth is, the writing world works much like every other business in the "real" world...and in the real world, you have to network. Oh sure, there will be a few who get discovered simply due to their awesomeness, but even they must fight through the horrors of initially being an unknown. Case in point: Embedded below is an interview with my current favorite author, Chuck Wendig, on Sword and Laser. You should listen to the whole thing, but at 16:49, he talks about a particularly nasty rejection letter he received from author Thomas Monteleone...who advised him to quit writing. Luckily for those of us who love great stories (and the Miriam Black series), Mr. Wendig didn't listen. But as inspiring as that story about overcoming a douchey response from a dreaded "gatekeeper" may feel, it's not a license for you to wait to be discovered. If you're submitting lots of short stories to publishers, that's great. Welcome to the club. The medical tape and antiseptic are over there on that table with all the blood. But unless you somehow find a way to get Tor.com to publish your work ten times a month, you won't get rich doing that. Heck, just getting them to publish you once is basically the new writer's version of winning the lottery. I'm not saying don't go for it. Submit your stuff to the top publishers. 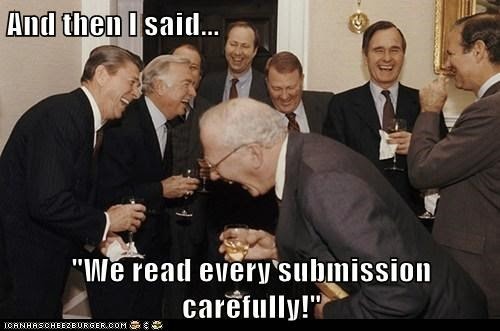 Maybe an editor or slush reader will choose yours out of thousands upon thousands of submissions. But in the mean time, there are small press editors right down there in the trenches with you, fighting and clawing to make a name for themselves. Maybe their start up publishing house will grow into a pro paying market....or maybe they'll get snatched up by an already established and expanding one that needs more editors. But if fortunate does shine down upon them, they just might already have a list of authors whose work they know, like, and trust from when they started out...like when you submitted to their first time publishing endeavors. None of this means you suddenly get a golden ticket into Published Town. You won't be able to send the sequel to Baboon Fart Story and roll naked in the resulting piles of cash. It just means that might have a better chance of making sure your very best stuff gets seen, read, and considered. 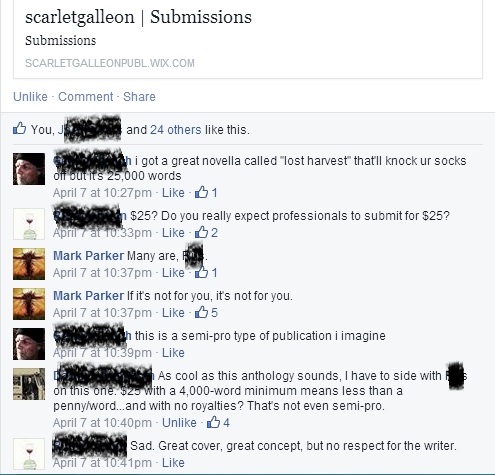 So send your best work to small press markets like Visionary Press, Noodle Doodle, and Scarlett Galleon. If it gets accepted, then at the very least you'll receive a small paycheck along with your work appearing in a very professionally edited and constructed book. You'll also make friends with some very cool and passionate people who are putting all they have into becoming a publisher. From a human and professional standpoint, that's worth a whole lot more than $0.01 a word. To get updates on when new articles or podcasts are published (and occasional random musings) 'Like' the official RamblingBeachCat.com Facebook page. Every time someone does, another new author realizes that they won't get rich publishing short stories.